Do you need training in SPC…? Do you need to train your employees in SPC…? Do your customers require SPC…? Are you getting ready to start using SPC program…? Are you not seeing results from your SPC charts…? Do you want to quickly improve your SPC methods…? Do you want to apply SPC correctly to your processes…? If you answered yes to any of the above questions, then you need to take this class. Download this SPC training video and use it to train all of your employees who need SPC training. These employees include quality department employees, process and design engineers, operators, technicians, or anyone who works on or with your processes. 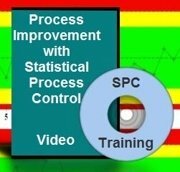 Statistical Process Control (SPC) is a scientific visual method used to monitor, control and improve processes by eliminating special cause variation from manufacturing, service and financial processes. It is a key Six Sigma tool. SPC directs the process champion when to take action to adjust or investigate the process. SPC also prevents inappropriate or unnecessary process adjustments. SPC tells you when there is special cause variation or when the process is drifting. SPC can be used to catch machine wear, operator setup issues, raw material changes, and differences between similar machines. Overall, one uses SPC to prevent defects from occurring and to drive process improvement.